Legislation that would make New Jersey the sixth state to legalize physician-assisted suicide moved forward in the New Jersey legislature Thursday afternoon. 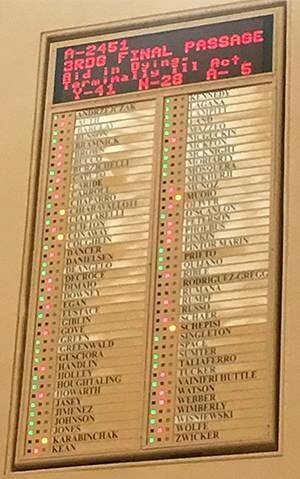 The Assembly voted, 41-28, Thursday to approve an "Aid in Dying" bill that would allow some state residents with a terminal illness to request a prescription that would end their lives. Five states — California, Montana, Oregon, Vermont and Washington — have laws permitting terminally ill patients to end their own lives. For New Jersey to join them, the bill must now pass the Senate and be signed by Gov. Chris Christie, who voiced opposition to a similar bill passed two years ago. "I think we've done good work here," said Deputy Speaker John Burzichelli, who sponsored the bill. "My position all along has been, I'm not suggesting that anybody should do this. My issue is, where should the law be?" The bill, formally known as the Aid in Dying for the Terminally Ill Act, includes strict provisions for permitting physician-assisted suicide. Only terminally ill adults with a prognosis of six months or less to live are eligible to request a prescription. They also must be deemed capable of making a medical decision. The patient's diagnosis, prognosis and decision-making capability must all be confirmed by both their physician and a consulting doctor. Prospective patients must make a trio of requests to their physician — once in writing and twice in person. The second in-person request must come at least 15 days after the first. The written request must be signed by two witnesses, including one who is a neither blood relatives nor stands to benefit from the patient's estate. The bill does not force physicians to provide such prescriptions. It instead requires physicians to refer the patient to another doctor that is willing to prescribe aid-in-dying medication. The bill is modeled after Oregon's Death with Dignity Act, adopted in 1997. Last year, 218 people received a prescription via the Death with Dignity Act. Of them, 132 people died from ingesting the medication. The overwhelming majority had cancer and nearly all — 92 percent — were enrolled in hospice care. "We've designed the bill to be a vehicle for personal choice," said Burzichelli, a Democrat from Gloucester County. "That's really what the structure is and what it reflects." The Assembly passed the same legislation two years ago, but the state Senate never voted on it. A companion bill to the current legislation is sitting in the Health, Human Services and Senior Citizens Committee of the Senate. Physician-assisted suicide legislation has been opposed by the Medical Society of New Jersey, the National Disability Rights Network and some religious groups, such as the Roman Catholic Church.